Bi-Parting doors for freight elevators, designed to meet your freight elevator specifications, are available through TRICO. UL Listed, NYC MEA approved, manual or automatic bi-parting doors are made from the highest quality standard you trust. TRICO will help you choose the bi-parting doors that best fit your specifications. Our highly trained installation teams can install the bi-parting doors you choose anywhere in the New York or New Jersey area or we can ship your freight elevator doors wherever the installation is needed. Regular Bi-Parting Doors - These door panels open vertically away from each other. Regular bi-parting doors are used when there is about 1-1/2 times the door height between floors. Pass Type Door - These types of door are used when there is an insufficient amount of room between floors to meet the requirements of a regular bi-parting door. The door panels open vertically and slides behind the panel of the floor above. Using this type of application, the truckable sill on the lower panel is wider than a regular bi-parting door. 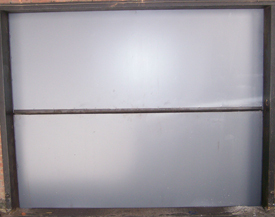 Single Panel Door - These doors consist of one panel which slides in the upward direction. This type of freight elevator door is used when there is sufficient amount of overhead clearance. TRICO is the only company you need for quality, reliability and price on freight elevator doors including bi-parting doors. Contact us at (718) 349-6565, download our brochure, or e-mail us at orders@freightelevatordoors.com for more information. Our knowledgeable sales professionals are ready to assist you with any questions you may have concerning freight elevator bi-parting doors or any of our other products.